For day 2 under Breakfast across countries, I selected to make Burmese Naan Flat-bread with Pe Byouk. This combination dish was one of the first pictures that tempted me to take up this country. And also the dish that made me rethink think on my choice of flatbreads for the week. 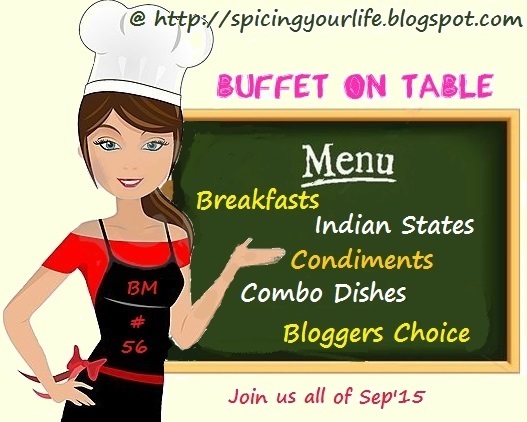 Initially I had planned this for Combo dishes. When I decided to do flatbreads, it was obvious this gets pushed to week 4. And this is also one post that eluded me in terms of not getting enough data over net on this preparation. I spent many days, trying to figure out how this is made. In the end, it turned out to be the simplest of the dishes. Read this site, if you want to know what a hold this breakfast combo dish has on the people of Myanmar! I finally made my own version after being inspired by this, this and this. Traditionally or how this is served in Myanmar is that a ladleful of Pe Byouk is served on a Naan and it is eaten as a wrap. Some say one can use the regular rotis to wrap this, some serve Parotta as well. Take the flour, salt, sugar, and butter in a wide bowl. Rub in the butter into the flour, till all is incorporated. Gradually add the milk and knead well. I added more milk than recommended as I was not using the eggs. Transfer to an oiled counter and knead again for 10 mins. Continue kneading till the dough becomes soft and pliable. Let it rest for 30 mins. Pinch out balls and roll out again. Shaping the flatbread is again done in different methods. Stretch well to form a thin layer, apply some oil over it. Next comes the important step of creating the layers in the flatbread. First method will be to fold two ends over so it becomes an elongated shape. Fold over opposite sides to create a square. This will not create many layers. Then you can cut from the center of the circle to the other edge. Take one edge and roll around the circle to form a cone. Put the cone upright and press down with palm to create a disc again. Third method will be folding the two sides of the circle inward to create an rough rectangle. Pick up both ends of the length, stretch to form a long rope and wind into a ball. Flatten the dough again into a disc with the palm. Once the folding is done, cover with a damp cloth so that a skin does not form on the surface. this is similar to our parotta making as well. Once this rest for a while, pan fry the bread on hot tawa. As with the Naans, I roasted the second stage over flame, and then rubbed in butter. Serve with Pe Byouk on top. 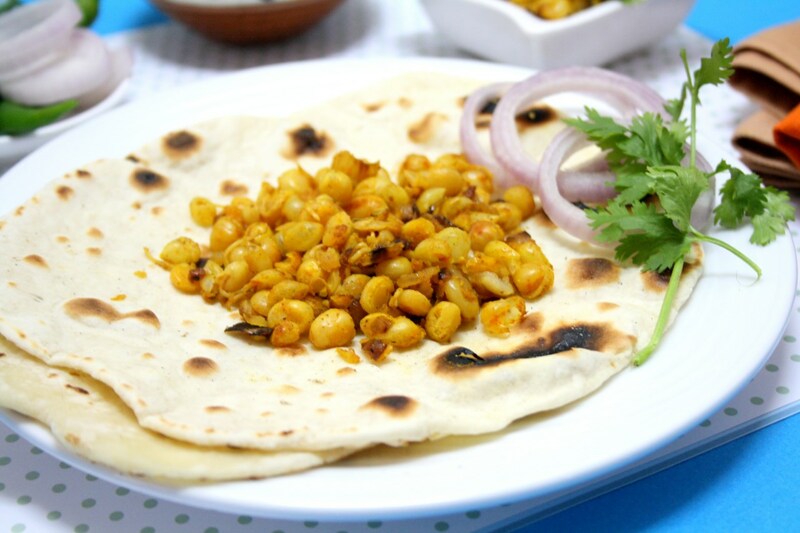 I like this breakfast..it is something like Indian mattara with kulcha..must try this, I am sure to like it. Looks more like our style of breakfast paratha and mattar!!! Perfect with that yellow peas!!! I can eat this breakfast anytime a day.Lovely dishes. wow sometimes when reading it from internet make us think it is the difficult dish. But it wont be. Glad you figured out. I love flat breads and yours turns out nicely. 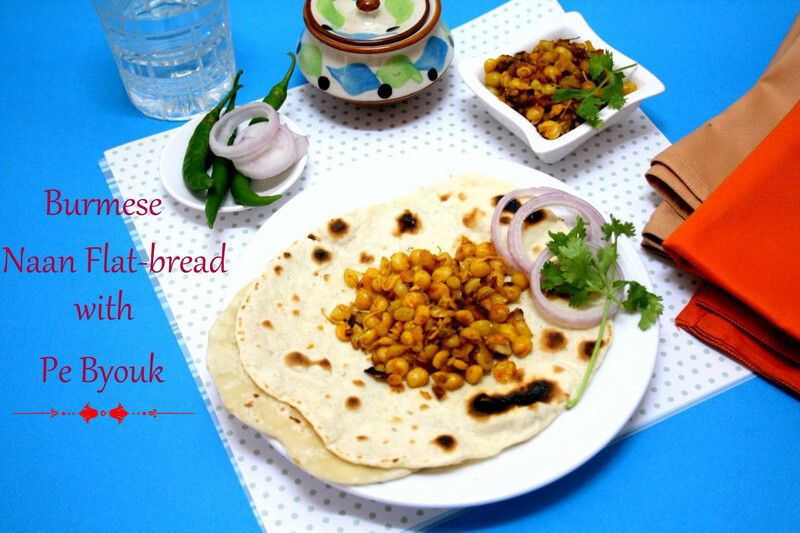 Sounds almost like our parathas na, that pe byouk sounds like a prefect side dish to have along with this flat bread. Wow! very interesting bread there. What a delicious Burmese breakfast Valli. Good choice. Ok Valli this is within my rolling skills. Will make it some time soon. These sound like our own parathas. Delicious choice. Simple and filling breakfast naan with pe-byouk.